It seems like everyday I’m reading about another drone project being funded through KickStarter, IndieGoGo or some other crowd funding website. This particular design, the C-mi (see-me), caught my eye when I read that it was designed by “rocket scientists.” That statement did set my bar kinda high for the design and while I had high hopes, I wasn’t overly impressed by what the PolyHelo team delivered. Stowable: Its frame is designed to pack easily in a small case or backpack. All-Weather: Its structure and built-in camera housing are designed for all weather use. 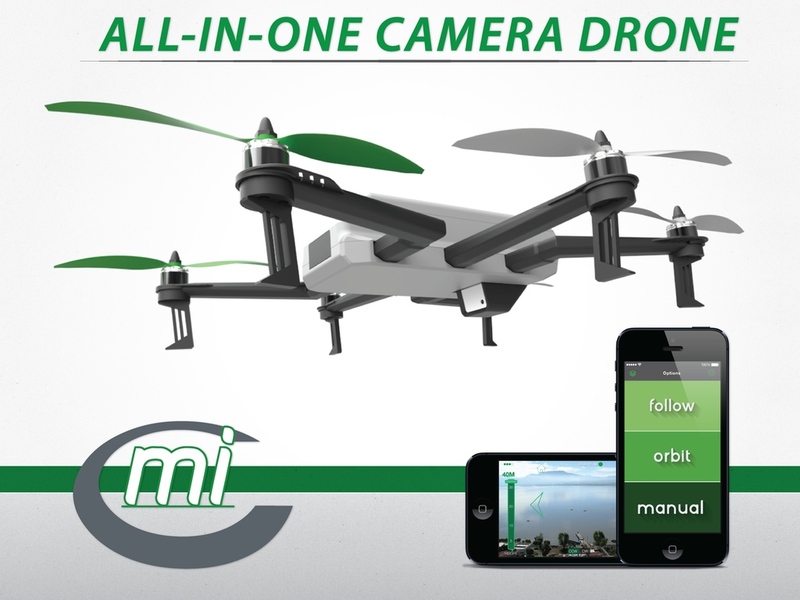 Integrated Flight and Camera Controller: C-mi’s digital user interface has been designed so that you can easily control the flyer, dynamically change the camera modes and view live video during flight, and directly share images and video – all from a single app. The PolyHelo team was frustrated that in a saturated market, they couldn’t find a single drone that combined all of the features they consider necessary to make it not only useful but easy to use as well. They came to this conclusion after they considered everything from storage size to the quality of camera gimbals and mounts of various drones. So what sort of technology does the C-mi pack? It’s another drone controlled via a phone app. It has a “1080P HD camera in a protective case and on a high-precision gimbal.” The weather-resistant enclosure extends down from the drone at takeoff and retracts while landing. Software wise, the C-mi offers multiple flight modes. You can manually pilot the drone, it helps if you are a trained drone pilot, or you can take advantage of various automated modes. Here is a blurb from the C-mi KickStarter page about some of the automated features. Just tell C-mi where you want it and it will maintain that position wherever you go. With GPS and camera feature tracking built in, you can change camera targets seamlessly during flight. Direct your own multi-character movie! They also mention some of the C-mi features designed to help with media sharing. C-mi makes sharing painless with its built in network. C-mi can support multiple interacting GPS target devices, relay data between multiple C-mi vehicles, and share footage directly to the cloud and social media. You get to focus on the imagery you want to capture, not how to fly or manage the system. PolyHelo designed the C-mi to be modular. C-mi is fundamentally designed to be modular. The high-level image processing and flight behavior is separated from the low-level flight control, and multiple C-mi flyers can be networked into a larger, modular swarm. However, this modularity also extends to the vehicle structure. C-mi was designed to be easily stowable. C-mi’s six arms attach and detach from the core module for easy transport and storage. Taking advantage of this design feature, the core C-mi module has been built from the ground-up for plug-interchangeability with future heavier-duty six and eight arm configurations that can carry compact and DSLR cameras. Smartphone Precision: We developed our software so that a smartphone can be used as a precise camera tracker. In Unit Camera System: C-mi’s integrated, weather resistant, HD camera system extends at takeoff and retracts when landing. Remote Audio Capture: Record synchronized audio from your smartphone device while C-mi is recording video from above. Share Instantly to Social Media: Our app makes it simple to share your C-mi video on major social media platforms. Wireless Data Transferring: Easily move images and videos that are saved onboard C-mi to your laptop with no wires. Portability and Storage: C-mi’s removable arms makes it easy to take anywhere and quick to get into the air. Brushless 2-Axis Gimbal: C-mi’s gimbaled camera provides precise targeting and shake-free video. GPS Tracker: Use our GPS tracker so you can have C-mi follow where you might not want your mobile device to go. Track your friend while they’re swimming or surfing! Hey, even though it follows, they didn’t claim to be the “first auto-following drone” (which seems to be the most common blurb amongst crowd funded drones these days). For more information, you can check out the KickStarter campaign and read C-mi: The First All-in-One Camera Drone by Rocket Scientists. The Polyhelo team designs and builds software and hardware for open blade multirotor systems and other unmanned aerial systems (UAS). They have experience in spacecraft sensor design and spacecraft instrumentation and their team of electrical, mechanical, and software engineers solve current UAS problems and influence the future of UAS technology.